On his opinion on the scale of the job, ‘This is not a dream job. This is reality. I am Manchester United manager. The reality is that this is a job that everyone wants and I have it. I know the responsibility and the expectation. At the same time I know the legacy. I know what’s behind me. I know what the history is and what the fans expect from me. The challenge doesn’t make me nervous because my history was always to live with big clubs’ expectations’. 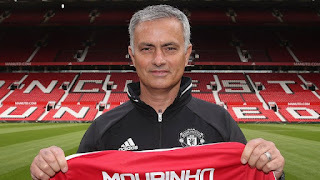 His ambitions for the team was vivid as he said ‘It would be easy, honest and pragmatic for me to focus on the last three years, and the fact we didn’t qualify for the Champions League, and to say, ‘Let’s work, let’s try to be back in the top four, let’s try to do well in the Europa League’, but I am not good at that, and I don’t want to be good. I prefer to be more aggressive and to be more aggressive is to say ‘we want to win’. I could anticipate that one of you will come later with a question about style of play, and what is before is the result of the style of play. I can anticipate that by saying that you can win a short competition and you can win a couple of matches without playing well. But you cannot win a competition without playing well. What is playing well? It is scoring more goals than the opponent, it is to concede less than the opponent, it is to make your fans proud because you gave everything and you win. I want everything. I want to win matches, play well, play young players, score goals, not concede goals’. On the club and team reputation he said ‘There are some managers that the last time they won a title was 10 years ago. Some of them have never won a title. For me it was one year ago. If I have a lot to prove, imagine the others. For so many years, for the fans success was just routine, but I want to forget the last three years. I don’t want the players to start the season by thinking ‘we have to do better’. What is to do better? To do better is to finish fourth. To finish fourth is not the aim’. Among other issues he commented on transfer targets ‘We made a nucleus of four positions as priority, to give a certain balance to the squad, and a certain push in terms of quality and the qualities I want, especially the ones with more vision. We decided four targets and from them we have three. Until we don’t have the fourth we are working hard on that, with Mr Woodward and the owners. When we have the fourth, we will breathe, and the market will be open, because there is no way we will get the fourth on August 31’.